Leftists all over the nation are finding out the hard way that Americans are sick and tired of their radical, violent, intolerant, uninformed, condescending behavior. And by “the hard way” we mean that Lefty businesses whose owners make fools of themselves by hating on Americans who hold traditional values, are losing money, losing sponsors and sometimes even closing the doors. Immediately her post drew heavy criticism for her apparent support of the random killing of 58 Americans and the injuring of 489 more. 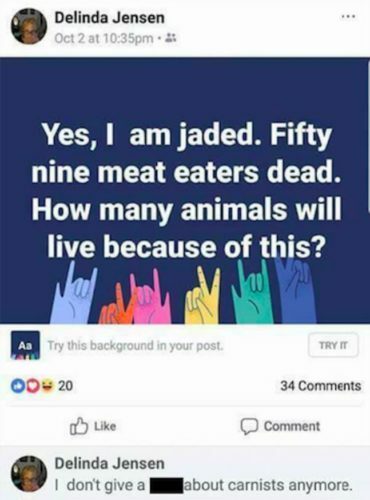 In her view, it’s okay because they were “meat eaters.” Of course there’s every probability that many vegans were among the dead and injured. But that aside, it takes an evil person to wish death on others for the simple reason that you disagree with them on what to eat. No, it was evil, not poorly written. She said exactly what she was thinking. And what she regrets is that she has lost business and the respect of her community because of her ugly attitude. Delinda Jensen has shut down the business and hidden the bright green truck in storage. She has also deleted her social media accounts and installed security cameras around her home, as she is afraid to go out. Well, Ms. Jensen, how does it feel to be afraid? Not very good, does it? You can stop with the whole “we are non-violent” nonsense. You just celebrated the violent senseless deaths of 58 Americans. That’s called being violent, as the Left usually is when they want to get their way. The Wilkes-Barre community has seen you for the fraud you are; preaching peace, but stoking the fires of hate and violence. Your truck says “sharing a little piece of peace.” But what you actually shared on Facebook was a big piece of hate. Sounds like major mission creep. No doubt Ms. Jensen will have lots of time to think about her nasty behavior. 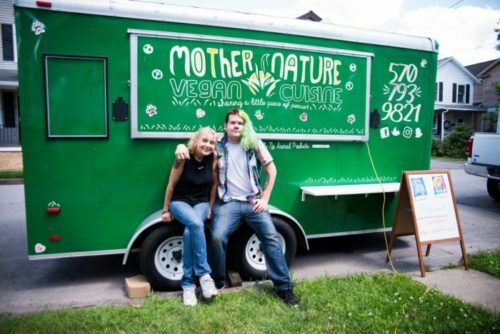 Because she won’t be selling vegan food.